Let me give you a clue about how to spot a bad bill, no matter what it happens to be about. See the picture above? 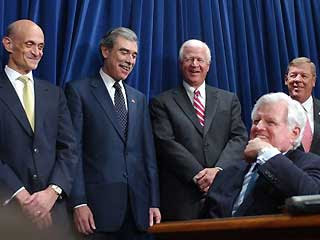 Notice that Ted Kennedy is smiling? LOL...he looks like he's having a good belly laugh over it. Seriously, what's with this whole immigration thing? I wonder if they took a poll how many Americans actually want immigration loosened up. Aren't the politicians supposed to be representing the will of the people, or am I just naive?